There is something beautiful buried inside of all of us that helps us be aware of ourselves and our world. What if the bar was the place to help us improve this concept called consciousness? Now that’s different! How does consciousness and the bar even end up in the same sentence? Well keep reading. Consciousness is defined as the state of being awake, and aware of your surroundings. If someone asked you to explain what that means, could you do it? We all have it and experience it, but yet it’s so hard to explain. We are not going to spend a great deal of time trying to uncover the scientific meaning of being conscious. Because really smart people have been trying to do that for years. It has a lot to do with how the brain operates and who really understands that? We will focus on tips for improving your awareness using the bar, which is very important in developing your state of consciousness. You need to hang around other people and avoid isolation in order to be happy. Social isolation is a state of complete or near-complete lack of contact between an individual and society. Not only do we need to communicate with others, we need to interact with them face to face. So social media doesn’t count! And the bar is one of the best places to get this social interaction. Here are some tips to improve your awareness at the bar. The bar is the place to go if you want to be honest and hear the truth from others. Liquid courage helps people lose their inhibitions and feel free to be more open. So the goal is to use that magic to have a realistic conversation with you. Grab a drink and talk to yourself. It sounds crazy but is it really? We spend so much time living on everyone’s terms but our own. It doesn’t hurt to be brutally honest and the bar helps bring that out. We get so caught in the routine of life. Go to gym, school, work, sleep, eat, and repeat. Week after week, month after month, we do the same things over and over. We get so caught in living that we forget to ‘live.’ Part of living is learning who we are and understanding how we make decisions. Emotions play an important role in how we think and behave. They influence the choices we make about our lives big and small. So take a few shots at the bar and figure out what triggers your emotions. Acknowledge them because they are valid. Track and manage them best by understanding what they are and why you have them. And work not to feed into the triggers to stay in control of them. Be aware of how you feel before and after drinking alcohol. Understand why you drink and what it represents in helping you solve problems. Learn and listen to your body and give it what it needs. Going to the bar doesn’t imply you need to get drunk while there. Drink to uncover some things that may be suppressed due to being so busy with the distractions of your daily life. Bad consequences usually come after drinking lots of alcohol. But what if you knew that going in and approached it differently? First off, it helps to understand your tolerance. Drinking brings out our raw emotions and exposes things that we hold back naturally because we are just so busy. When you understand the consequences and repercussions of your actions, it will help you avoid being impulsive and have regrets later. One of the tricks to improving states of consciousness, is experiencing the realities of life. Watch people at the bar and pay close attention to them. Study their actions and watch what they do. Liquid courage allows people to be brave and be willing to speak and act fearlessly. Listen to folks and learn from them. You will be surprised what a random person will tell you after a few rounds of Jameson. It may help you figure some things out. Pay attention to the bartender, managers, security and other bar goers. This is a good representation of everyday people attempting to solve the life puzzle. Keep track of everything going on around you. Process this information and develop the ability to perceive things critically. 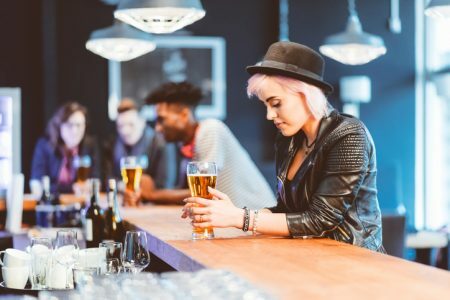 Spend more time at the bar connecting with people versus being consumed with ‘friends’ & followers on the social networks. Seek to learn about the world in its true element as much as possible. We are constantly busy consumed with others and not enough time is spent on improving our own character. When your brain is consumed by some activity, it starts focusing on that. Nowadays, everyone is preoccupied with social media in some way, that they forget about self introspection. Trying to live your life similar to others and impress them at the same time can be disastrous. They may not who they really appear to be, but yet their day to days consumes your thoughts. Go to the bar alone and meet new people. Grasp what really goes on in the ‘real’ world with people who frequent the bar just like you. Meditate at the bar? WTF… Wait listen! You need to develop your perception so you can learn to be more aware. When you meditate, you observe your thoughts and emotions from the outside. So why do it at the bar and how? While meditating is typically done in silent and relaxing places, it is also not about shying away from things that make you feel uncomfortable, difficult or distracting. Sitting in a relaxed place alone is not exclusive to other forms of meditation. Bringing that mindset and awareness with us as we shop, go to the bar, or interact with complete strangers is very important as well. So grab a table or sit at the end of the bar and try it. We promise you won’t look like a dummy and it’s even a good conversation starter. If you don’t drink, you can still practice this technique. The bar is a good place for social interactions and to get valuable perspectives of the world. And if you do drink and looking to build your awareness at the bar, grab an Uber or Lyft when your done.